On January 9th last week, POSCO won the Grand Prize for the newly created “Herald’s Top Award in Job Creation” in the category of “New Industry Vocation.” The award ceremony, which took place at the Korea Chamber of Commerce, aims to recognize the commercial industry’s various efforts to create jobs during the current climate of the tough job market. Among the attendees were several leaders from both government and private sectors such as Mok-Hee Lee (Vice Chairman, National Commission on Job Creation), Jae-Kap Lee (Minister of Employment and Labor), and Yun-Mo Sung (Minister of Trade, Industry, and Energy). POSCO has been recognized for its exceptional effort in boosting employment in future-oriented fields like the Internet (IoT), artificial intelligence, and Big Data all geared towards smartizing operations in the fields and the offices. By creating high-quality jobs, POSCO managed the workforce in a way that corresponds with the government policy. In the congratulatory address, the Vice Chairman Mok-Hee Lee remarked, “In 2019, the government is due to provide a progress report on the current employment situations in Korea. The Commission will implement government policies that lead to actual job creation and continue our endeavor to establish creative employment policy.” Vice Chairman Lee further pledged full-on government support via reforms in finance, tax, and public sector regulations. Trade Minister Yun-Mo Sung who also acknowledged how the growth and investment from corporate sectors can enhance job creation, promised his utmost support for the industry’s effort to create more jobs. 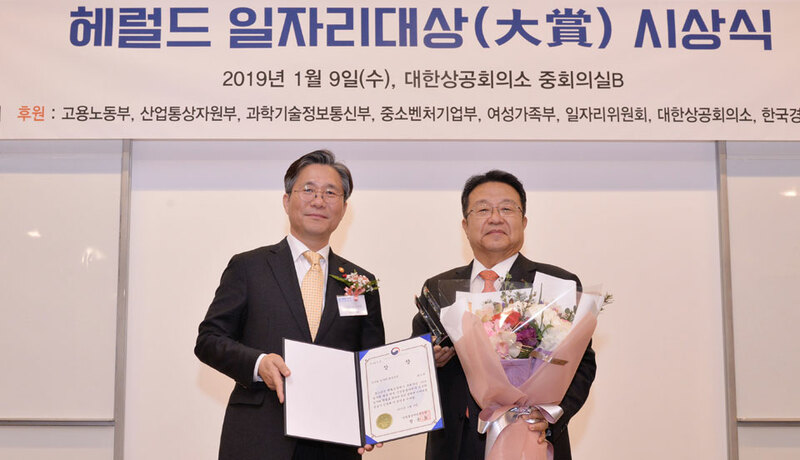 Besides POSCO, Hanwha Advanced Materials, SK Innovation, Samsung Electronics, KEB Hana Bank, CJ Freshway and Hyundai Motor were among the recipients in different categories. To create quality jobs, the POSCO Group is striving to maintain a sound management system, reassess the company’s competitiveness by developing new business and technology. The company also supports job seekers through such programs as Corporate Practical Employment Education, AI-Big Data Academy, and Incubating School for Business Startups. For the job seekers in Pohang and Gwangyang areas where their factories are located, POSCO supports partner companies by connecting them with talented jobs seekers. The company also offers practical support by hiring 250 graduates of vocational schools like Meister School through ‘School-Employer Connection.’ The company also offered 41% of its non-regular workers regular employment. In line with the Group’s mid-long-term investment plan worth 45 trillion KRW (40.2 billion USD), POSCO plans to recruit 20,000 new employees by 2023 in the fields of steel, materials, and energy.